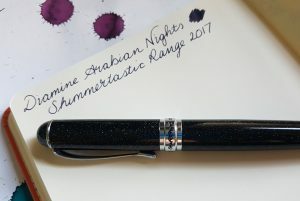 Faber-Castell is an often-neglected manufacturer of fountain pens. I have three of their Looms which are wonderful entry-level pens with very smooth steel nibs. 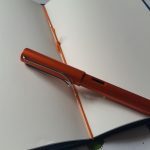 Despite the Loom’s good looks, low price, and lovely writing experience, they are rarely mentioned in recommendations for beginners, in favour of Lamy Safaris and Pilot Metropolitains. This neglect is repeated in their mid-market pens too, which is a real shame. Hopeful, we at United Inkdom can counter this a little. Executive Pens Direct lent us at UI an e-Motion Parquet Black to test drive, so I am doing a joint review with my own e-Motion Pure Black. 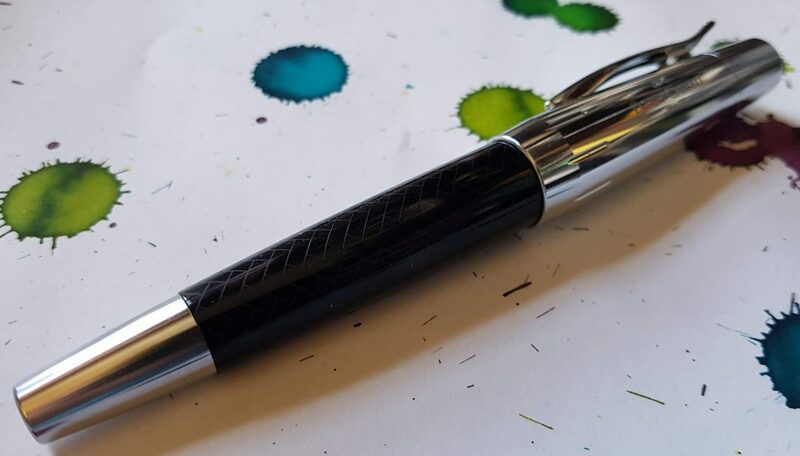 The Parquet pen features very shiny chrome-plated cap and trims, with a high gloss black parquet resin barrel. The cap features the Faber-Castell name and logo (as most, if not all, of their pens do) and has a hinged clip. In fact, the finish is so shiny it was pretty tricky to get anything approaching a decent photograph of it. The Pure Black is a different beast altogether. Although the same size and shape as the Parquet, the Pure Black is completely black and completely matt. 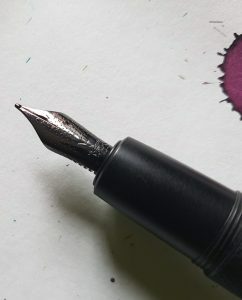 Even the nib is black. It’s the Batman of pens (more so than the bat patterned Montegrappa Batman pen, IMO). The anodized aluminium barrel has a guilloche pattern which adds some interest and grip. The cap has the same engraved name and logo, and hinged clip as the Parquet. The most obvious difference when using the two pens is weight. 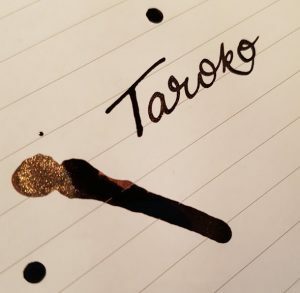 The Parquet, with its resin barrel, is an average weight fountain pen which should be manageable by most people. The Pure Black is considerably heavier and, combined with the pens fat barrel size, it may not suit every hand. However, the writing experience with both pens is great. 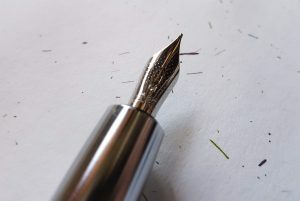 F-C make excellent steel nibs: smooth and wet and a real pleasure to write with. 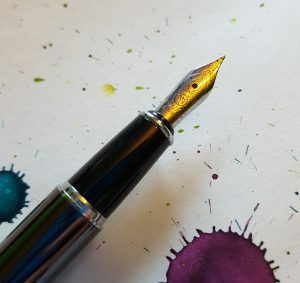 The nibs in their lower priced pens are the same, which is why I am so disappointed that F-C pens are so often overlooked. 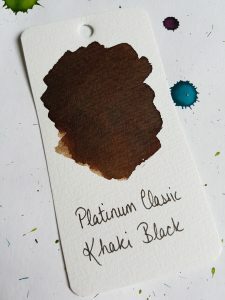 For reasons I am not at all clear on, it seems to be tricky to get anything other than a medium nib on F-C pens in the UK. Not impossible, but certainly tricky. I’m ok with an M but choice would be good. 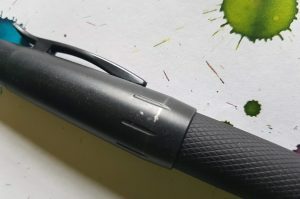 The M is comparable with other German M nibs, like the Lamy, but a wider line than a Japanese M, so if you prefer your pen strokes slim, I recommend you search for a stockist with EF or F nibs. These are low mid-range pens which pack a lot of punch for the price. The Parquet is currently available from Executive Pens Direct for £78 (reduced from £87) and the Pure Black for £128 (down from £150). You should expect to pay in the region of £70-80 and £110-130 respectively. From experience, the Pure Black will take quite a bashing. It feels like a tank. 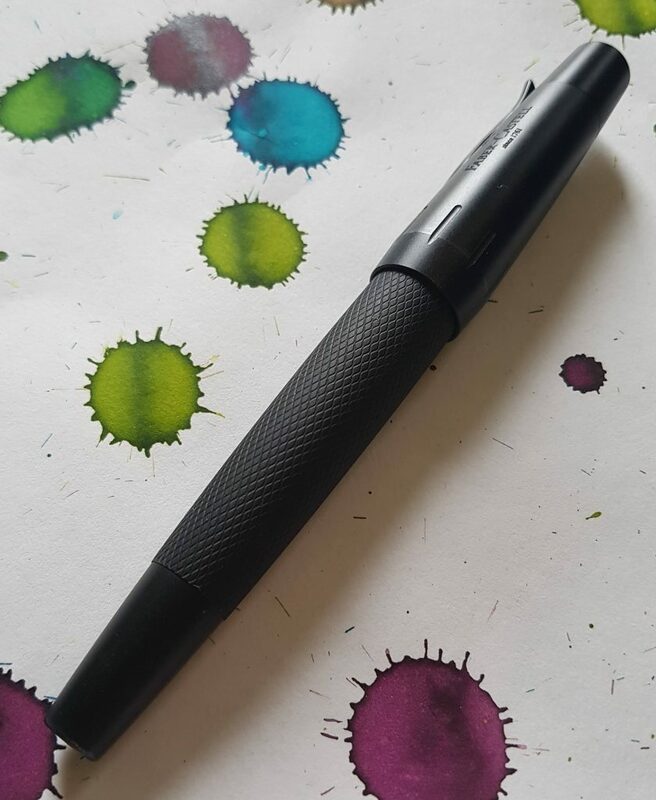 I was given mine for my birthday three years ago and it’s been filled and in light use almost constantly in that time, carted around in my pencil case or on my desk. It can be prone to hard starts if it’s been left unused for a while, but that’s not unusual. 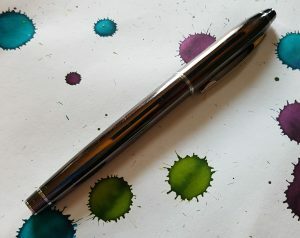 The finish has held up well, especially compared to Lamy Al-Stars which seem to scratch fairly easily. As is no doubt clear, I’m a fan of F-C pens. They’re solid, reliable pens with some smart design features and they look great. 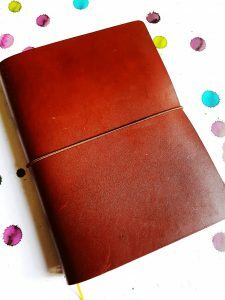 A few months ago, I reviewed Start Bay‘s rather gorgeous A5 traveler’s notebook cover. Start Bay have kindly sent United Inkdom another model to test out: the Navigator A5 Slim. A5 slim is not a thing. If it is less than 145mm wide, it’s not A5. If you buy a kilo of cheese, the supermarket doesn’t get to call it “1kg lite” and give you 780g. 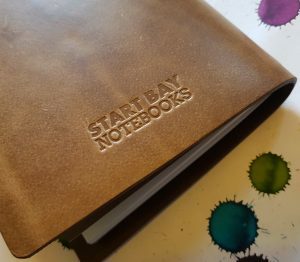 The Start Bay TN cover reviewed here is the same size as the Midori ‘standard/regular’ size, and calling it that seems to me to be more helpful and accurate. Who knows what size inserts an “A5 slim” takes? Whereas, it’s easy to find standard size TN inserts. 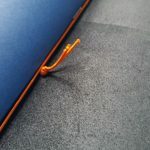 The TN comes wrapped in a fabric cover. It looks gorgeous. I’m not sure I’d use this as a cover day to day though. The leather looks like it will age well with some scuffs and bumps, and I try to reduce the fuss and fankle of additional bags and pouches unless they’re useful. 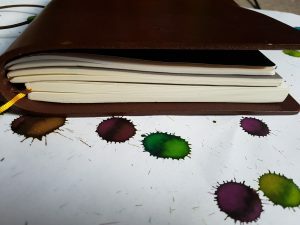 The leather is their “vintage” colour and is lighter than the Start Bay TN I reviewed before and while I probably wouldn’t have chosen this shade had I not seen it in the flesh, it’s actually really lovely. It’s a softer leather than the Navigator but is still moderately stiff. What you prefer in this respect is down to taste: my own TN is made from very soft, floppy leather (review to come), which don’t suit everyone. This, and the very stiff leather of the Navigator, feel more hard wearing and like they’d stand up to being thrown around a bag everyday than soft leathers. The finishing and details on these TNs is very good. 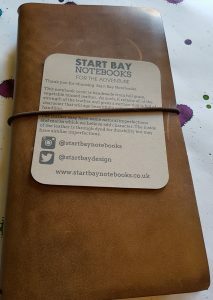 As well as the fabric pouch, they are discretely embossed with Start Bay on the back. 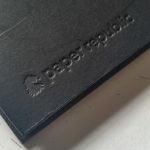 The company now offer their own branded notebooks to go inside. 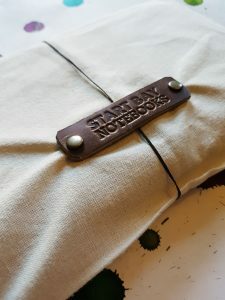 These have kraft covers which match the leather browns nicely, and attractive writing-themed cover designs with an inkwell on the dot grid and a dip pen on the plain. They are currently only available for the standard size (this one) and in dot grid or plain paper. The dot grid has soft blue dots. The plain paper feels thick and good quality, but I didn’t do a pen test on either. I continue to be impressed by Start Bay. This is a lovely piece which will age well, and last. It’s got a classic look and high quality, unobtrusive detailing which should appeal to many people. Were I in the market for a new TN, Start Bay would be my first port of call. 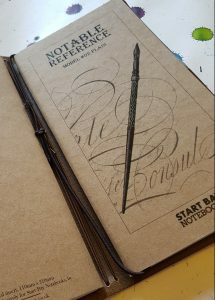 The Scrikss pen arrived on my doorstep from United Inkdom. It was not a manufacturer I was aware of before, and I have not uncovered much information beyond the basics about them subsequently. This may be because the company is Turkish and there is limited info in English. However, they are well-established (making pens since the 1960s), and the model 35 which I have tried out here is a decent pen. I was only able to find one UK stockist for the brand, but Andy’s Pens don’t carry this model at present. It’s therefore difficult to give an idea of what this pen costs. Similar models retail below £40 and my best guess would be that this model would set you back in the region of £35, if you can find it. It’s a nice looking pen, elegant and understated. The titanium finish is a deep grey. The high shine makes it a little difficult to photograph. It can look almost black if it’s not in good bright light. The chrome trim and clip make a pleasant contrast to the dark grey body. 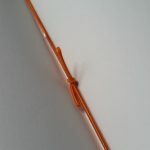 It could easily be used in a work setting- it’s an unobtrusive pen, unlikely to offend even the most staid and unreasonable office colleague. 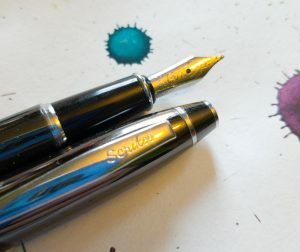 It definitely looks like a more grown-up pen than a Lamy Safari or Al-Star. It’s slim and smooth, altogether more elegant. The pen also comes in a chrome finish, which I am sure would be equally sophisticated. 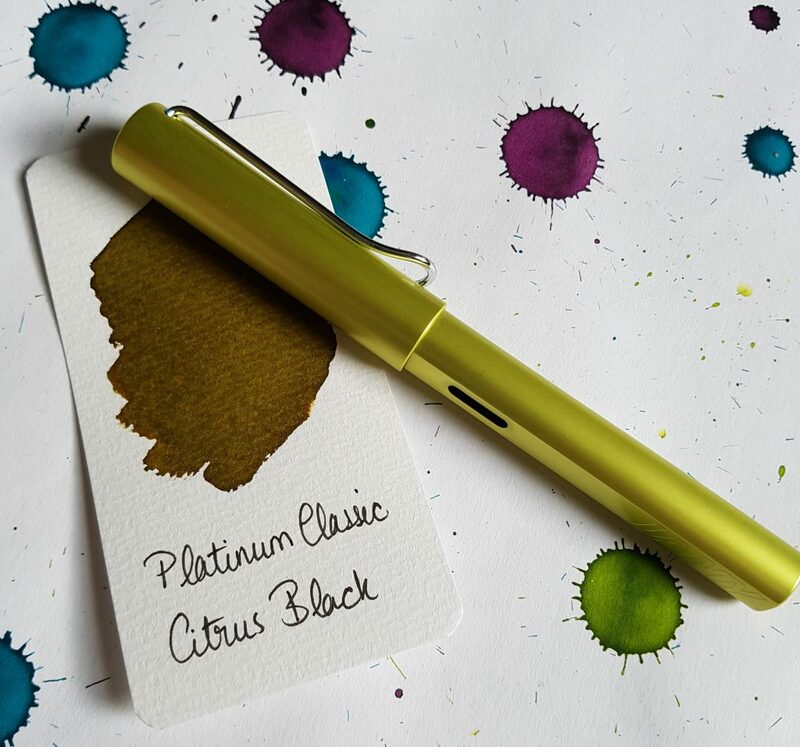 While it does look good, it may be a little uninteresting for those of us who like a bright coloured pen or something a bit fancier. 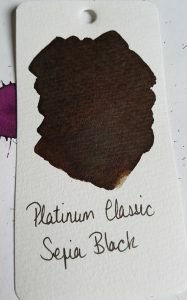 If you like to match an ink to the pen, Diamine Graphite might be a good bet here. 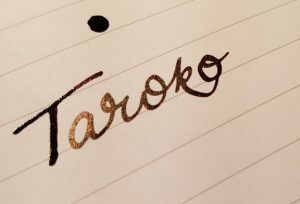 It’s a smooth writer for what I assume to be a steel nib (it’s certainly not gold) and pleasant to use. The nib does not indicate the width, but I’d put it at medium. 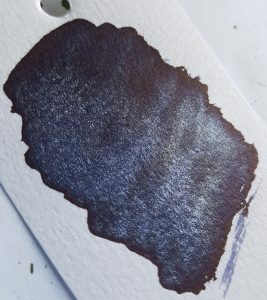 I’ve had it inked with Organics Studio Walden Pond Blue and found it to be pretty reliable. 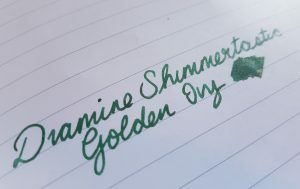 It writes fairly wet, which works with a strong sheening ink like WPB. 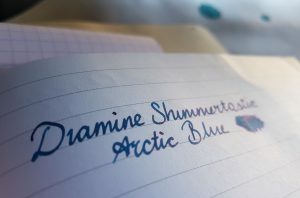 Although the cap can be posted, I didn’t like the feel of the pen when I did this. It felt slightly off balance, and like the cap was insecure posted. Objectively, it was perfectly securely placed, but it wasn’t comfortable for me this way. I almost always post my pens so this was a little unusual for me. Your mileage may vary. My conclusions on this pen are that it is a nice, smooth writer with elegant looks at a reasonable price. However, it’s a little uninteresting to me and I think I’d neglect to use it if it were part of my collection. It’s just a little too business-like for my tastes. 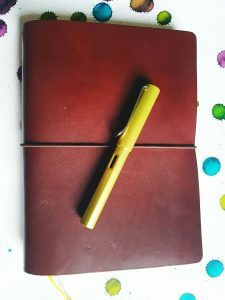 Perhaps I’ve been spoiled by the bright colours of Lamy Al-Stars and Faber-Castell Looms? That, however, may be a great recommendation for others! I’d be interested to see different models from this manufacturer though, and I hope that more UK stockists have a look at them. 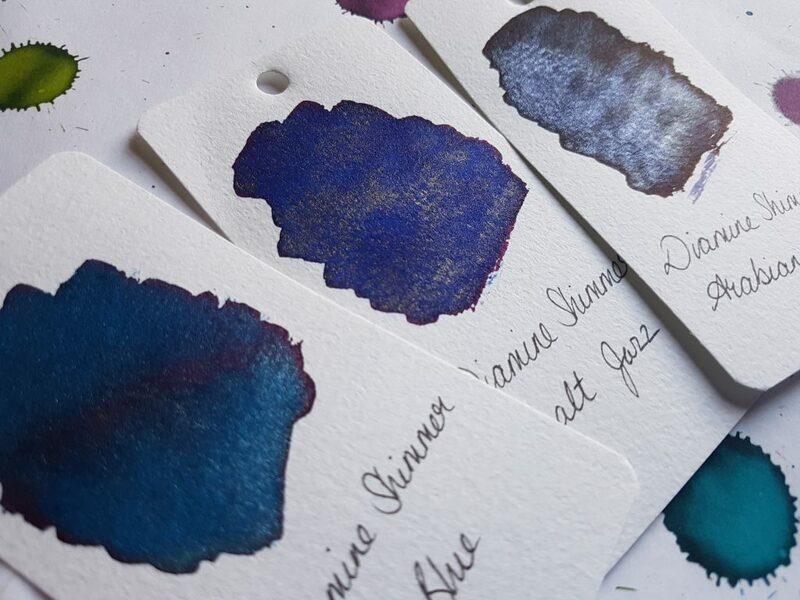 Sparkling and shimmering inks are a Big Deal right now. 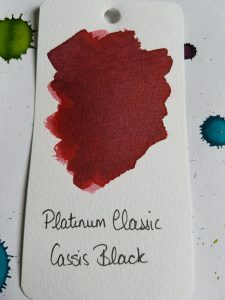 It started with J. Herbin’s 1670 Anniversary ink, Haematite, which is a lovely, deep red with a subtle gold shimmer. 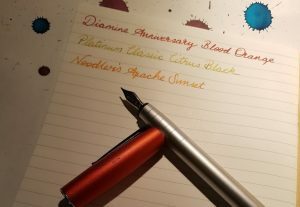 Further Anniversary inks followed. 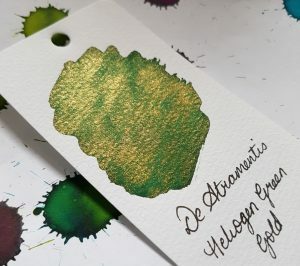 Most notable of these was Emerald of Chivor, an amazing dark teal with red sheen and gold shimmer. 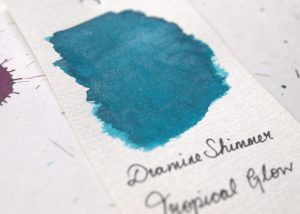 Diamine brought out some of their own shimmering inks a few years after Herbin, some of which I reviewed here. 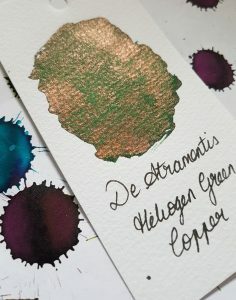 Now de Atramentis are getting in on the act, with their own pearlescent inks. 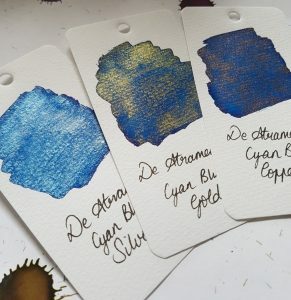 So, if shimmer inks are a big deal, are we reaching saturation point? (Excuse the pun.) 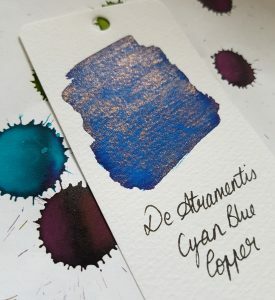 Well, de Atramentis have introduced a little innovation here. 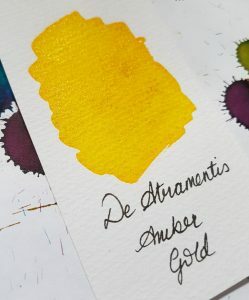 Herbin and Diamine have produced ink with a complimentary shimmer colour, but de Atramentis offer a choice of shimmer. 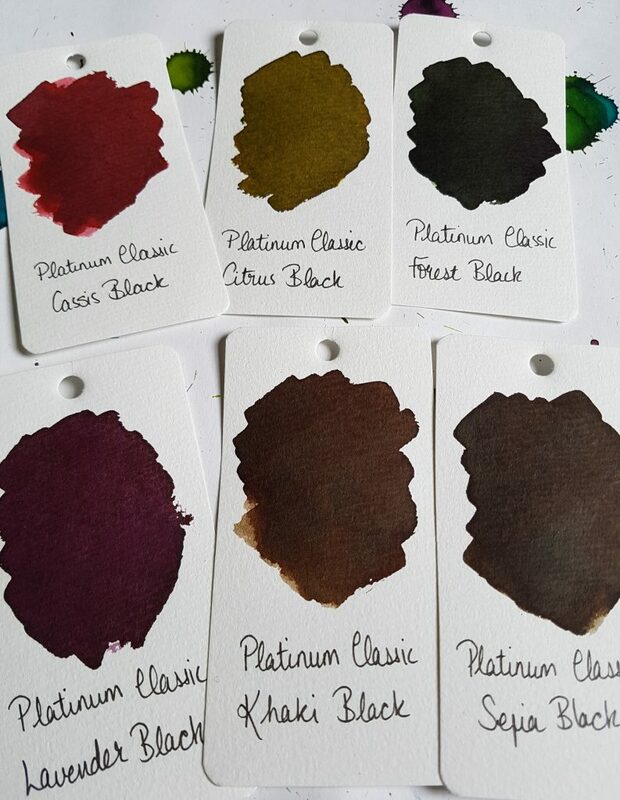 Each of the ten ink colours in the pearlescent range is available with gold, silver, or copper shimmer. 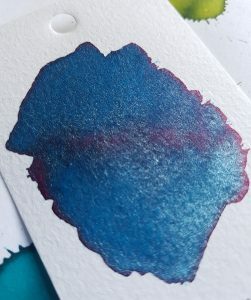 The first thing that I noticed on making ink swabs was the sheer amount of shimmer particles in this ink. 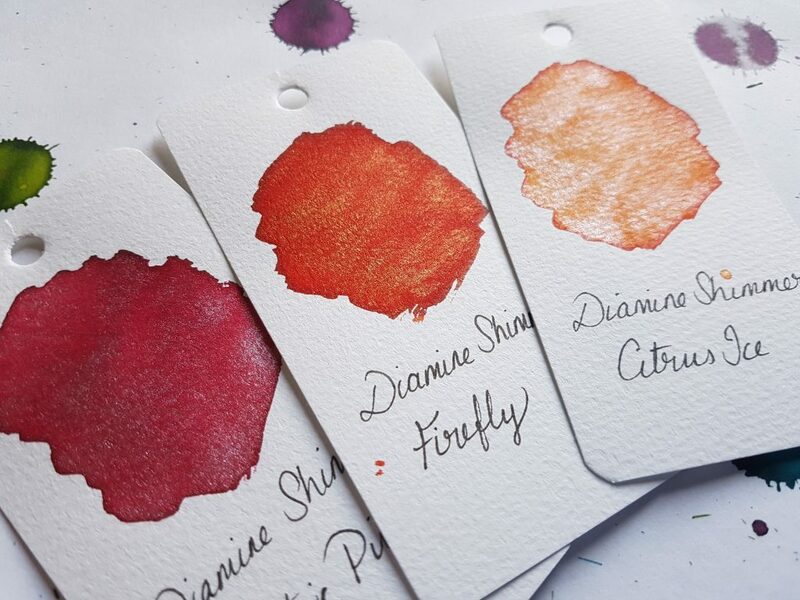 There is so much more than Herbin or Diamine inks. For many people, this will come as good news. This shimmer is not subtle! 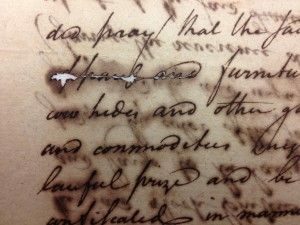 A word on pen hygiene. 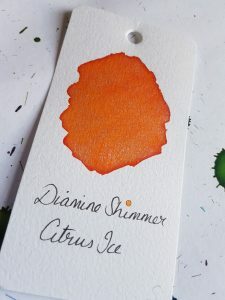 Many people are reluctant to put shimmer inks in their pens for fear of clogging. I am not overly concerned about this, but I don’t tend to put this in my best pens. 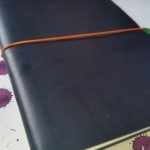 I have never had a problem with clogging in my Lamy Al-Stars though, even when I’ve left it in them unused for weeks. 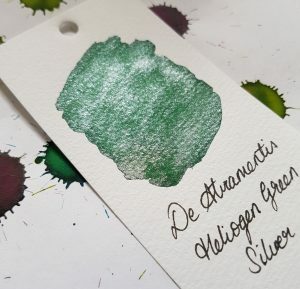 The significantly higher concentration of shimmer particles in these inks may make me a bit more reluctant to leave it in pens for a long time. 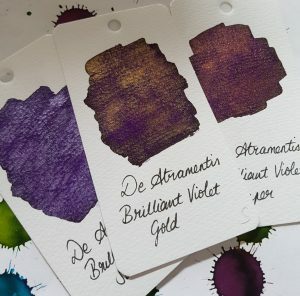 De Atramentis have kindly offered United Inkdomsome samples of these inks for review. 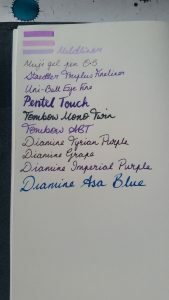 Pure Pens carries some of the colours to buy. 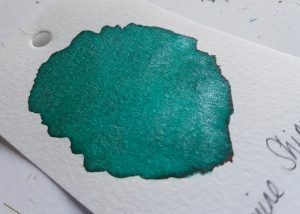 The base ink here is a medium green which works well with all three of the pearlescent shimmers. 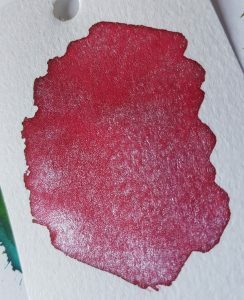 As you can see from the picture, the different coloured shimmer makes quite a difference to the look of the ink. 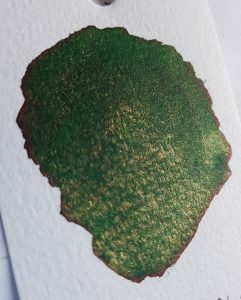 The contrast of the warm copper and green is really lovely and quite unusual. 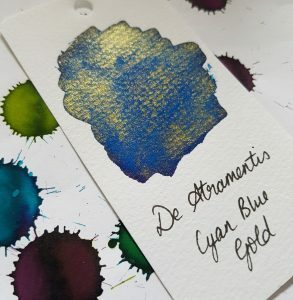 The de Atramentis inks have a LOT of shimmer particles in them so the effect is easy to see, especially so with this combination. I am not sure this is something I would have bought had I not seen it in action first. However, having used it, I am pleasantly surprised at how well the combination works. This is another lovely contrast of warm and cool. 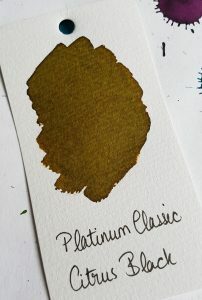 It is less strikingly unusual and could be compared it to Diamine’s Golden Oasis. 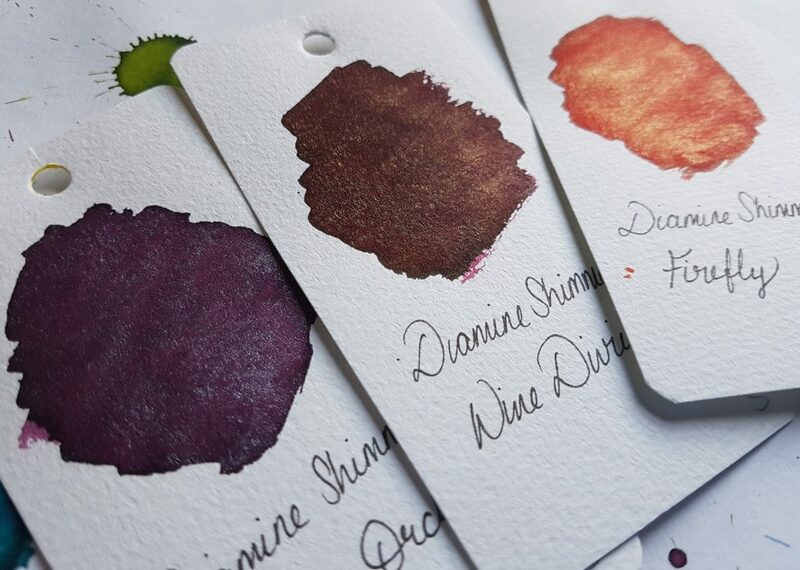 Diamine’s offering uses a lighter coloured ink and has a more subtle shimmer, though. 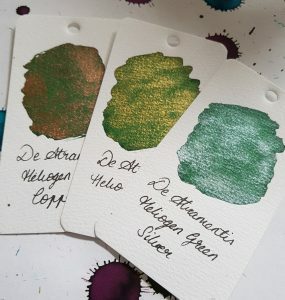 Green and silver are a nice combination, and to my mind, a bit festive. 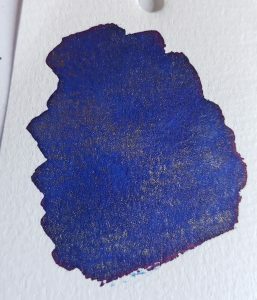 The base ink here is not accurately described as cyan, but is a lovely royal blue. 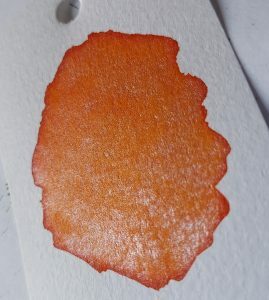 The Copper shimmer again proved to be a successful and surprising combination. The contrast between the blue and the orange copper is beautiful. 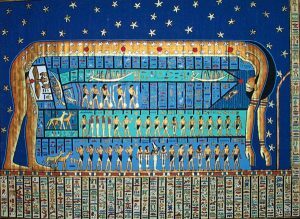 The blue and gold is beautiful too, and reminiscent of Ancient Egyptian art with its use of gold and lapis lazuli. 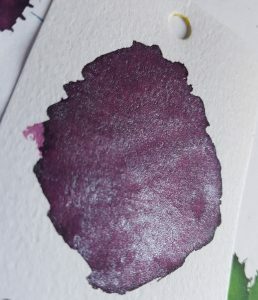 A sort of Ink of the Pharaohs? This was my favourite of the samples I tested. 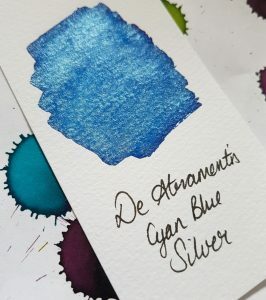 The silver shimmer works really well with the blue ink. It looks like an icy pool in the swab sample. The colours compliment one another very well. 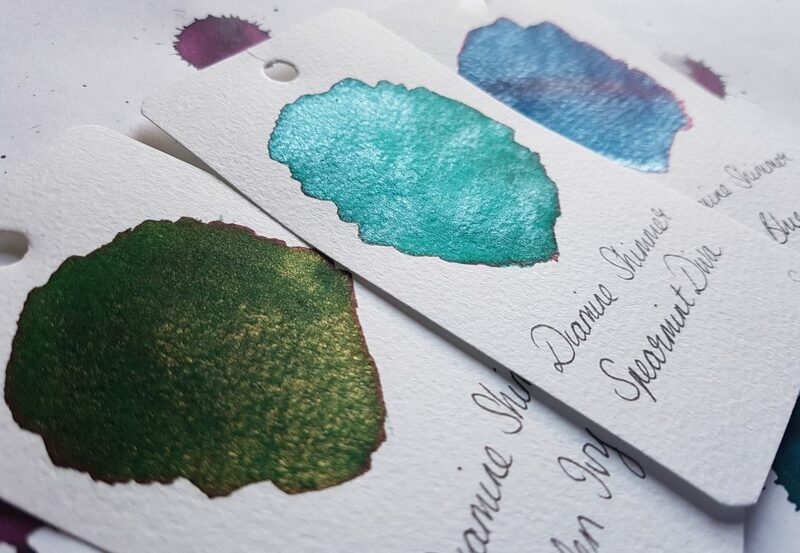 Like the green, the blue and silver combination really shows how much shimmer these inks have. 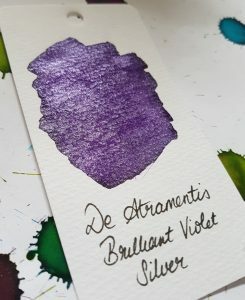 I expected to like the Brilliant Violet inks more than I actually did. 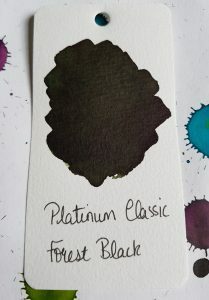 I didn’t feel that any of the shimmer colours went well with the shade of ink. 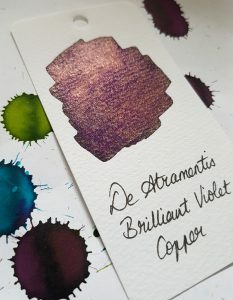 The contrast between the purple ink and copper shimmer did not do it for me. 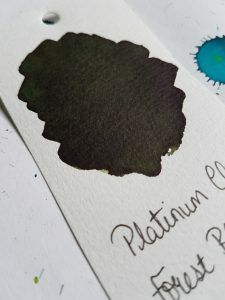 Unlike the contrast with this shimmer and both the Green and Cyan ink, this created a bit of an odd ink that I can’t imagine ever wanting to use. This is nicer than the Copper. Purple and gold are a classic pairing. 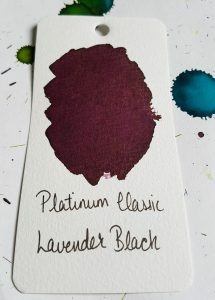 Purple and silver are also a good pairing, and I’m sure this ink will have some fans. 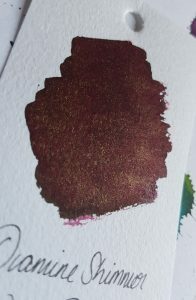 I only have a sample of Amber with Gold, so I can’t compare to the other shimmer colours, but it’s rather lovely. 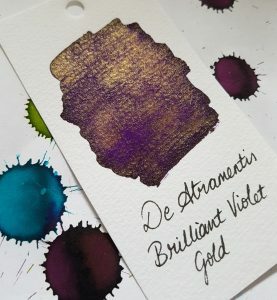 It looks very pale and transparent when the ink first goes down on the paper but it dries quickly to a lovely warm yellow. The gold shimmer with that shade is quite beautiful. 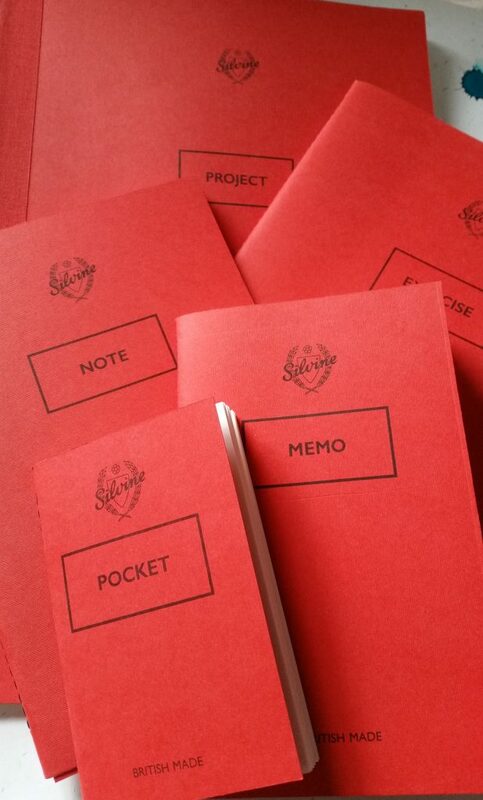 A surprise winner in the Pocket Notebooks stash was the tiny Silvine Originals Pocket Notebook. 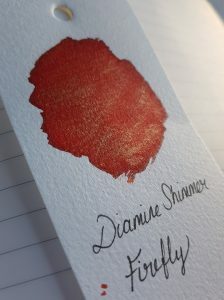 Silvine kindly sent a few of us United Inkdom reviewers some additional products to test out. 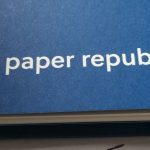 As I said before, I didn’t expect much from the tiny Pocket, but its unassuming plain cover hid some pretty impressive paper. The pages admirably handled everything I threw at it. 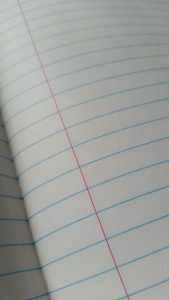 The paper is pure white, unlined in the case of the Pocket, and noticeably thicker than most notebooks. It has a little texture to it, but not a huge amount. It might even handle a bit of watercolour. Untidy finishing on the stitching. Blue ruling. 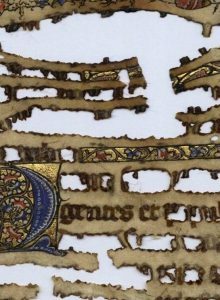 Perforated pages. 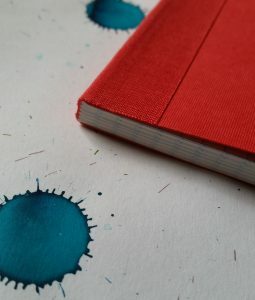 This is a handy pocket notebook at 97mm x 159mm, 52 perforated pages, and stitched binding. 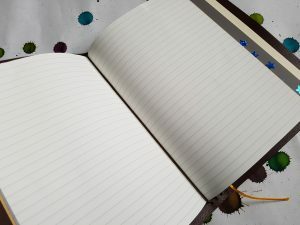 It might make a good bullet journal if you find the much-loved Leuchtturm 1917 option too bulky to carry around. 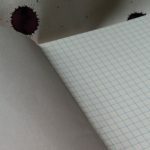 I wasn’t especially happy with the lines, and this goes for all of the Silvine ruled notebooks reviewed here. For me, the bright blue jars with the red cover and stands very starkly against the white paper. I prefer something more subtle, but this is a design choice that’s central to the branding so I don’t see it changing any time soon. The line spacing is 7mm which isn’t little too wide. 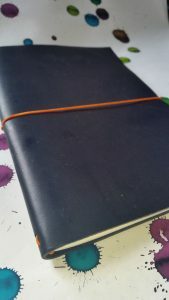 It does have the feel of an old fashioned notebook as a result of the blue lines, but I don’t think it looks good. 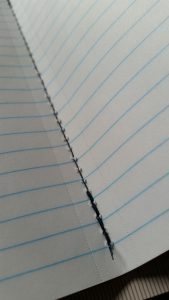 I’d definitely use this notebook with plain paper, or a dot grid provided it wasn’t printed in the same blue as the lines, but unfortunately, Silvine currently only manufacture this size with ruled pages. 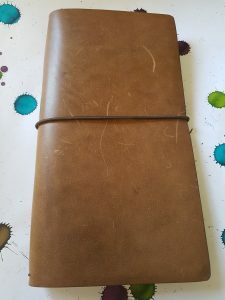 This is a great sized notebook (125mm x 190mm and 52 pages). 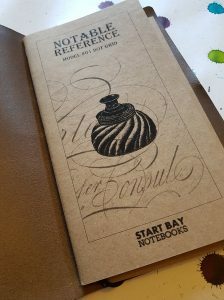 This would be an ideal TN notebook due to the high quality of the paper, but isn’t the right size. I’d be keen to see it in Traveler’s Notebook proportions (in addition to the Note size rather than instead). 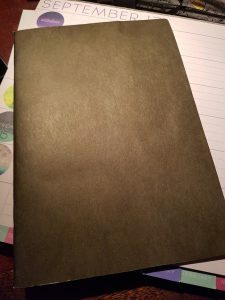 This was my favourite notebook of those sent by Silvine. It’s a nice size, and the plain paper is beautifully smooth. I can see me buying more of these. 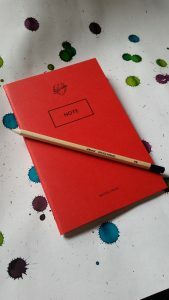 This is another nice sized notebook (162mm x 230mm, 52 pages), intentionally reminiscent of school jotters. 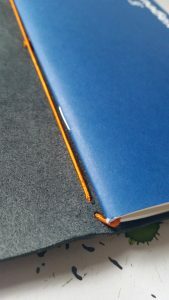 This too is a stitched binding with perforated pages, so it opens flat. This time, there is a red margin on the right. I quite like that, and think it might be nicer to have it paired with grey, or even red, line ruling. I just can’t get on board with that blue! 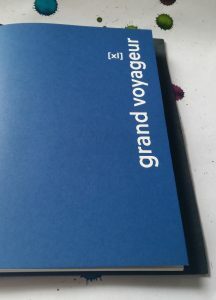 This is a bigger book, slightly narrower and taller than A4 in size (200mm x 305mm) with plain and squared pages (squared recto and blank verso). 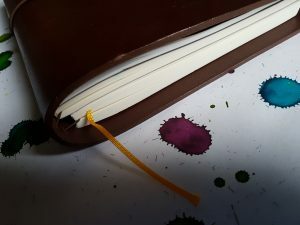 It’s a multi-signature sewn binding with a spine, so is different from the other, single signature, notebooks made by Silvine. 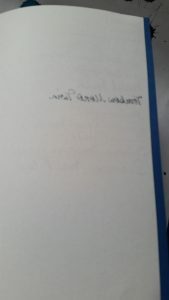 This allows more pages, and manages the weight of the increased size. It reminds me of softback version of school lab books. It’s a good size, and I can imagine that the squared and plain paper have many uses beyond drawing your Chemistry apparatus. N.B. Silvine sent these samples in return for an unbiased review. Prices indicated were taken from the Silvine website and were correct at time of publishing. Other retailers may vary.